Cloud as a concept has been around for two decades, but has picked up steam with the growing presence of “hyper scale” cloud providers in big data, analytics, artificial intelligence and IoT. Today, cloud is a compelling proposition for the Indian SMEs, enterprises and government. 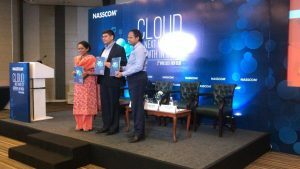 In light of this NASSCOM today, unveiled its report titled ‘Cloud – Next Wave of Growth in India’. The report done in collaboration with Google Cloud and Deloitte Touche Tohmatsu India LLP highlights the present and the future state of the Indian cloud market, identifies the major technology trends, issues and concerns with respect to the industry. It also focuses on the adoption levels of cloud computing across industry verticals, the IaaS and SaaS ecosystem and, analyses the cloud policy framework & its impact on the overall cloud industry. The report highlights that cloud spending is on a growth trajectory propelled by factors (both demand and supply) such as: Increased awareness of Cloud, consumerization of IT, proliferation of start-up ecosystem, diverse landscape of supplier ecosystem, rising investments in infrastructure, talent, strategic partnerships and the impetus from key digital-led Government programs. And here, both IaaS and SaaS are estimated to contribute to this growth. Factors that can drive the IaaS uptake in India are – an improved infrastructure, economic benefits, increased innovation, vibrant start-up ecosystem and connected ecosystem. On the other hand, lower cost of workforce, abundant talent availability, mature sales eco-system, adoption of newer technologies like AI, ML to build world-class products will boost the SaaS ecosystem.